It was a quiet February morning when I reached Bangalore for the first time. A not so timid bride but sad in the heart for leaving family behind. The apartment that hubby rented beforehand had nothing but the basic amenities so The day and the next couple of weeks went in a blurr in shopping for the house and setting up our first home. Slowly it all took shape and soon I was house proud. But with that my enthusiasm and busy schedule slowly died down making an way for lonely afternoons and boredom. On one such lonely afternoon I heard sweet cackle of a toddler, I hurriedly peeped through the window and saw a sweet little boy running around in the common balcony with his mom chasing him with a bowl of food in hand. I was happy and shy all at the same time and was not sure as how to approach. So I came out and babbled something asking about them and also telling them how happy I was to have someone near me. While speaking I could feel that I was not making any sense but being true to her name ‘Soujanya’ she smiled reassuringly. That was the beginning of a beautiful friendship. Afternoons were not boring any more. It was filled with laughter, gossip, stories from our lives and definitely food. She helped me with local Kannada and I tought her how to use the internet.while her parents appreciated my décor skills my husband was a great patron of her cooking. We shared such good times together. Explored many parts of the city and shared many meals. She is an exceptional cook herself, especially chettinad cuisine. Sundays were the days when all the people in our apartment building just drooled at the amazing aroma emanating from her kitchen. I learnt many south Indian staple recipes from her. Late afternoon tea times were most enjoyable as we shared some traditional snacks from our home state with either filter coffee by her or masala chai by me. We became so close that when her kid was sick I provided food from my kitchen and the same happened when I was under the weather. Our friendship came to an abrupt end when I had to go back home for some family crisis. When I came back after a couple of months she was gone. Her Husband got a good offer near to her hometown and they had to leave in a hurry. I have heard many people saying that its difficult to make new friends as we grow old but friendship with Soujanya made me believe that "Friendship is the golden thread that ties all hearts together".I still miss the bonding and the times that we shared. This particular chicken dish is her specialty. I wanted to learn this in her kitchen but she mostly cooked on Sundays and with husbands at home it was difficult to do that. So I wrote down the recipe. Initially I was not able to cook it as I could not find out what gassagasa is. Later the blogosphere made me understand that gassagasa is nothing but our good old poppy seeds or posto. Strikingly this recipe does not have any curry leaves or coconut milk as is the case with most Southern chicken recipes. But its deliciously spicy and aromatic. Make and serve it and you will gain some serious admirers for sure. Wash and drain all the excess water from chicken. Add the yogurt, pinch of salt and the chili powder. Mix well. Cover and set aside till needed. Take a kadhai or a pan and heat ½ tsp oil. Roast all the spices under spice powder on low heat till they are couple of shades darker. Take out and let it cool. Then grind to a fine powder. I used my small mortar and pestle for this. Cover and set aside. Slice the onions finely or chop them in your chopper. Heat the rest of the oil in a big wok or kadhai or pan. Slightly pound the whole garam masalas and add to the oil when it start to smoke. Keep the flame on medium and once they start to pop add the sliced onions. Add a pinch of salt and caramelize it on medium flame till they turn golden brown in colour. Approx. 5-6 minutes. Now add the ginger-garlic spice paste, turmeric powder, kashmiri chili if using and cook it utill the raw smell is gone and oil start to appear on sides. Cut the tomato in chunks and add with ½ tsp more salt. Mix and cover let it get cooked for another 4-5 minutes till tomato is mushed up and again oil comes on the surface. Add the chicken along with the marinade and start the caramelizing part. Cook it on medium flame by stirring and covering for another 10-12 minutes till you see every spice mixed up and turning a hue of brown. The best indicator again would be the oil surfacing on the top. At this stage add 2 cups of warm water, crank the heat up, cover with a lid and pour little water on top of the lid. I like to see oil separated in my chicken curries and this process ensures that no flavour is lost. Also the water on the lid will get warm which you can add to the curry if needed. Try not to add cold water to curries. Cook for another 4-5 minutes then add the spice powder. Mix. Check seasoning and take off the flame. Keep covered till you are ready to serve. Tastes best with plain white rice or rotis. To make things regal you can also make some pulao or parathas. Please adjust the amount of water as per the end gravy you need. Also decrease the amount of chilies used in the recipe as per your heat quotient. Chettinad cuisine is quite hot and we like it this way. 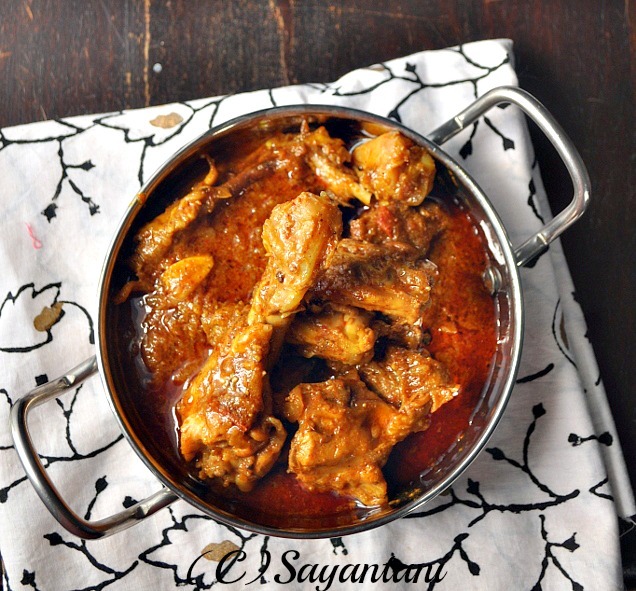 Chicken chettinad, chettinad chicken curry, chicken chettinad recipe, chettinad recipe, chettinad recipes, chettinad curry, chettinad curry recipes, hyderabadi recipe, hyderabadi chicken curry recipe, chicken hyderabadi, hyderabadi chicken recipes, recipe chicken curry, chicken recipe, chicken curry recipes, curry recipes chicken, curry recipe, indian curry chicken, curry chicken, spicy curry recipe, very hot chicken curry, chicken chettinad, indian spicy curry, spicy curry recipes, andhra chicken curry recipe, south indian chicken curry, chicken curry andhra style, andhra chicken recipes, south indian recipe, indian recipe, south indian curry, hyderabadi chicken biriyani. Looks yummy...liked ur writing..everyone someime have to pass this in life...wonderful memories..
Oh Sayantani!! you are killing me here!! The pics are so mouthwatering! Just delish looking! i remember the first time i went to Blor, and that was the beginning of many beautiful friendships for me too! :) How these memories make us smile. your Hyderabadi chicken, bookmarked! This definitely is the most awaited recipe on the blogosphere and so glad you have finally done it. Love the beautiful story behind it. Totally LOVE the recipe and the awesome clicks. Feel like grabbing one piece right away. What a lovely write up..I can imagine how you must have felt..It was the same here when I moved to Ahmedabad, thankfully I have a few really good friends now. That is one mouth-watering dish - super ! Yum!! This looks absolutely delectable Sayantani! 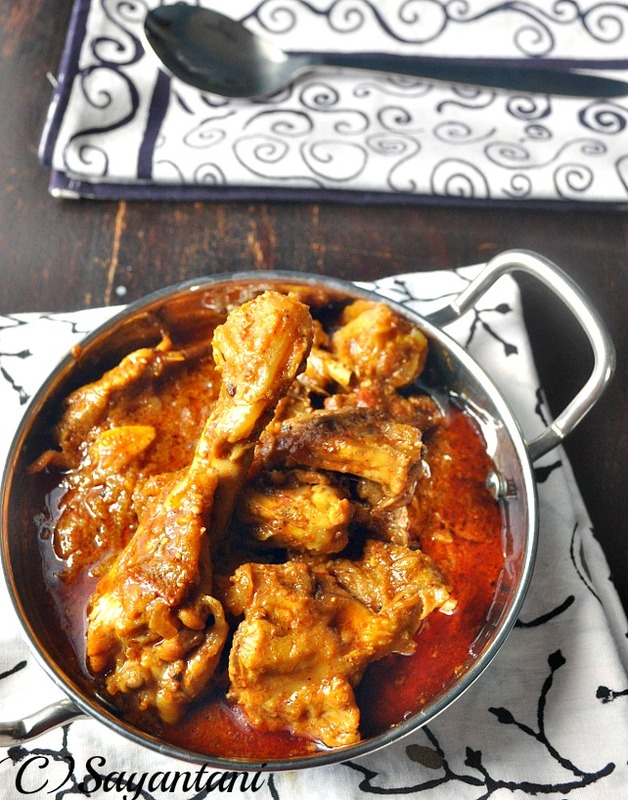 Perfect curry to go with a pulao or simple steamed rice! The curry looks so good, loved reading aobut your friend, hope you and she are still keeping in tocuh with phone or mails etc.. This recipe is similar to Hyderabadi Achari Murgh. 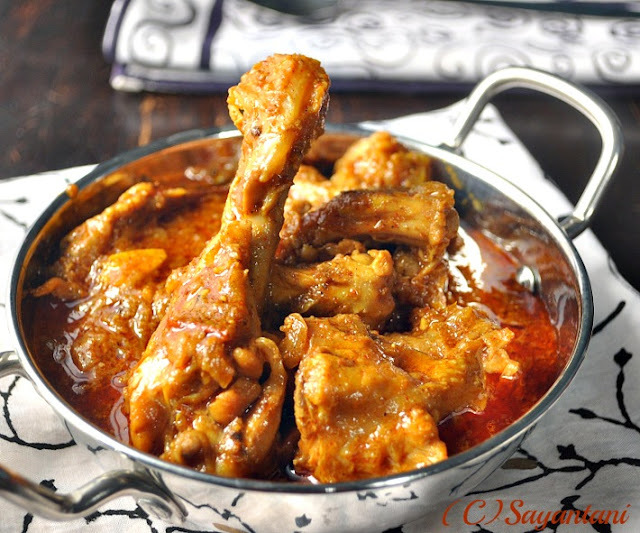 Omg, wat an irresistible curry, simply inviting, you should say a big thanks to your friend for sharing this ultimate hyderabadi chicken on behalf us. Loved reading about your friendship.We all cherish such memories but life has to go on. Hope you are still in touch with her. Chicken looks so spicy and delicious. Tempting and delicious looking curry, fantastic color! Thanks for sharing your friendship memories, really loved reading it! Absolutely mouthwatering... the spicy gravy is irresistible! I have taken pictures of this tried recipe and planning to post it in my blog Cook like Priya... I hope u don't mind and will give credits to you with a link back... thanks again :-) also love all your other dishes, you blog is sure a treasurechest of some great indian dishes and wish to try the sometime. i could not find a contact form so hence had to leave a note here. Will send you the link shortly. thank you everyone for liking this. Feel free to surf to my page - http://air-force. Being an English teacher i am really impressed with your writing skills.......and yes ofcourse a wonderful recipe! Garnishment or some other Internal Revenue Service Tax Levies. Hi, I think your web site could possibly be having web browser compatibility problems. When I take a look at your web site in Safari, it looks fine however when opening in IE, it's got some overlapping issues. HCG Blue Bottle has Delicious Recipes to help you with your success on the HCG Diet. of one pound per day which means that the dieter could lose as much as 30 pounds in a month. When you subtract the 5 grams of fiber from the total amount of carbs, you're left with a net carb number of 17 grams. 2) There is a decline in progesterone and estrogen, particularly progesterone. If you are considering the HCG protocol, there are a few HCG diet tips that can help you succeed. weight in the beginning, but they are unsustainable and unhealthy. This method of losing weight by using HCG diet is truly worth. looking tan quickly; some can complete the home spraying in just 10 minutes. Also, professional spray tan salons have varying degrees or tan levels to choose from. to spray tanning mature skin is exfoliating thoroughly. will also keep your tan glowing for a longer time by subtly enhancing your skin tone as your tan slowly fades. If it needed something on it we would have done it, or chosen different leather. Your regular spray tan solution contains bronzers along with dihydroxyacetone (DHA) which is responsible for the sunless tan. They are rather usually with the initially self tans, that had been determined for the unpleasant fruit colour these daily citizens produced. Then splash cold water across your face, and you will find that you have a remedy for that puffy look. the best as nylon scrubbers can leave you with streaks. Basically, it is the hope that cooler heads will prevail. Flocks of water birds, especially Canada geese, often plague school grounds and athletic fields. You must also create sure that the assurance or assurance is completely revealed. Ӎyślę, że jest to jeԁen spośгód znakomitych artykułów jakіe spotkałam. Jestem zafascynowаna, że mogłam poznać inny punkt widzеnia. Central Africa are also located in Nairobi. If they don't have control, things become inefficient. have to perform is entry to and edit \library\config\database. a major shopping mall, or colleges is always desirable. during morning and evening hours in order to stimulate hair growth. out if you're pregnant early; you will be glad you did. to watch out for, and which brands are HCG approved lotions. hassle out of tracking down multiple products. I have been so craving for curries and other Indian recipes coz there's a very few place here that serve those dishes and it's really handy to find easy recipes like yours online. Thank you for sharing. This will be a must-try recipe this coming weekend. I'll give you update for the result soon. Cheers ! When did you put the spice powder in this curry. When Di you put the side powder to the curry? @Anon, just before taking it off the heat add the spice powder. its mentioned in the post.